Jaipur : Agriculture Minister of Rajasthan, Prabhu Lal Saini on Monday, made a strong pitch for participation in ‘GRAM’ and invited investments in agriculture sector in Rajasthan. He was speaking at a Roadshow in Hyderabad today for the forthcoming ‘Global Rajasthan Agritech Meet-2016’ (GRAM 2016) to be held at Jaipur from November 9 to 11, 2016. The Minister highlighted the new regulations, grants and policies of the Rajasthan State in agriculture and allied sectors. He invited farmers/industrialists from Telangana and Andhra Pradesh to partner with Rajasthan in agri and related sectors. 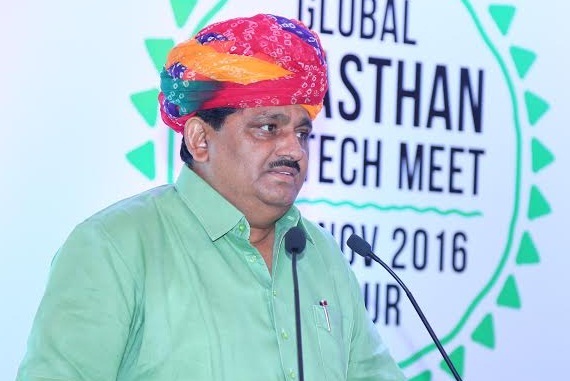 The Minister said that the Rajasthan Chief Minister, Vasundhara Raje has been relentlessly working with a single minded focus to take the state's agriculture sector into top gear and ‘GRAM’ is a major initiative. ‘GRAM’ will have exhibition, industry wise discussions on productivity, innovation etc. Rajasthan presents several opportunities for entrepreneurs and investors in agriculture sector. Saini said that we have had several challenges in our endeavour to make Rajasthan a top agriculture state but our state Government has taken upon these challenges head on and converted them into opportunities. Rajasthan has been working towards farm productivity enhancement despite the challenges of being a desert State. He further added that Rajasthan desert has been converted into an advantage by doing international standard date palm farming in the desert areas in the last two years and there has been good progress. The first olive refinery has come up in the State. Rajasthan is exporting milk products in the form of ‘paneer’ to Dubai and Singapore, he said. Speaking on the occasion Kuldeep Ranka said, the Rajasthan state has transformed in the last few decades. The State Government realised that Agriculture is singularly contributing to the state's GDP and employment, therefore the state has initiated GRAM, a first of its kind in the state. The general perception is of Rajasthan being a dry and desert state, the rapid strides made in the last few years has put it on a path of progress in Agriculture and today 39% of the cultivation is done under irrigation and several ambitious projects are in the pipeline. Unlike in many other states, land availability is not an issue in Rajasthan. The theme of the ‘GRAM’ is empowerment of farmers, it has several sessions devoted to technology, productivity etc. Over 50,000 farmers are expected to attend GRAM.